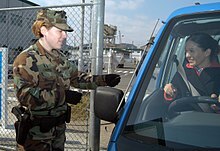 A sailor checks an identification card (ID) before allowing a vehicle to enter a military institution. When a credential is presented to a reader, the reader sends the credential's information, usually a number, to a control panel, a highly reliable processor. The control panel compares the credential's number to an access control list, grants or denies the presented request, and sends a transaction log to a database. When access is denied based on the access control list, the door remains locked. 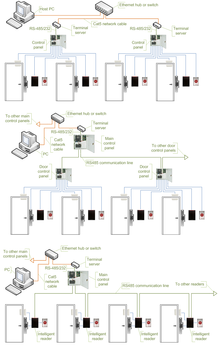 If there is a match between the credential and the access control list, the control panel operates a relay that in turn unlocks the door. The control panel also ignores a door open signal to prevent an alarm. Often the reader provides feedback, such as a flashing red LED for an access denied and a flashing green LED for an access granted. Access cards themselves have proven vulnerable to sophisticated attacks. Enterprising hackers have built portable readers that capture the card number from a user's proximity card. The hacker simply walks by the user, reads the card, and then presents the number to a reader securing the door. This is possible because card numbers are sent in the clear, no encryption being used. To counter this, dual authentication methods, such as a card plus a PIN should always be used. As of 2014[update], access-control models tend to fall into one of two classes: those based on capabilities and those based on access control lists (ACLs). ^ Niemelä, Harri (2011). "The study of business opportunities and value add of NFC applications in security". www.theseus.fi. Retrieved 2019-03-22. ^ Federal Financial Institutions Examination Council (2008). "Authentication in an Internet Banking Environment" (PDF). Archived (PDF) from the original on 2010-05-05. Retrieved 2009-12-31. ^ "MicroStrategy's office of the future includes mobile identity and cybersecurity". Washington Post. 2014-04-14. Archived from the original on 2014-02-16. Retrieved 2014-03-30. ^ "iPhone 5S: A Biometrics Turning Point?". BankInfoSecurity.com. 2013-09-16. Archived from the original on 2015-09-11. Retrieved 2014-03-30. 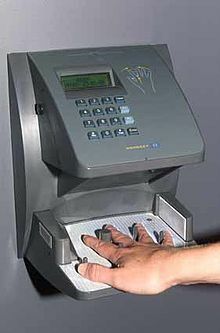 ^ "NFC access control: cool and coming, but not close". Security Systems News. 2013-09-25. Archived from the original on 2014-04-06. Retrieved 2014-03-30. ^ "Ditch Those Tacky Key Chains: Easy Access with EC Key". Wireless Design and Development. 2012-06-11. Archived from the original on 2014-04-07. Retrieved 2014-03-31. ^ "Kisi And KeyMe, Two Smart Phone Apps, Might Make House Keys Obsolete". The Huffington Post. The Huffington Post. Archived from the original on 11 March 2015. Retrieved 2 September 2015. ^ "Opening new doors with IP access control - Secure Insights". Secure Insights. 2018-03-16. Retrieved 2018-06-20. ^ "Incident Command System :: NIMS Online :: Serving the National Incident Management System (NIMS) Community". 2007-03-18. Archived from the original on March 18, 2007. Retrieved 2016-03-06. 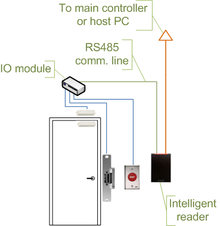 ^ "Smart access control polices for residential & commercial buildings". Archived from the original on 4 July 2017. Retrieved 11 September 2017. ^ "Cybersecurity: Access Control". 4 February 2014. Retrieved 11 September 2017. 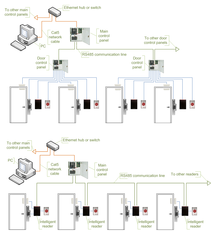 ^ "SP 800-162, Guide to Attribute Based Access Control (ABAC) Definition and Considerations" (PDF). NIST. 2014. Archived from the original (PDF) on 2016-03-05. Retrieved 2015-12-08. ^ Schapranow, Matthieu-P. (2014). Real-time Security Extensions for EPCglobal Networks. Springer. ISBN 978-3-642-36342-9. ^ "OrBAC: Organization Based Access Control - The official OrBAC model website". orbac.org. Archived from the original on 2017-06-10. Retrieved 11 September 2017. ^ "What is Data Hiding? - Definition from". Archived from the original on 12 September 2017. Retrieved 11 September 2017. ^ "Controlling Access to Members of a Class (The Java™ Tutorials Learning the Java Language > Classes and Objects)". docs.oracle.com. Archived from the original on 30 September 2017. Retrieved 11 September 2017. ^ ealigam@gmail.com, Satish Talim / Original design: Erwin Aligam -. "Ruby Access Control: Ruby Study Notes - Best Ruby Guide, Ruby Tutorial". rubylearning.com. Archived from the original on 29 June 2017. Retrieved 11 September 2017. ^ "Classes (I) - C++ Tutorials". www.cplusplus.com. Archived from the original on 4 January 2018. Retrieved 11 September 2017.